The Saud royal family are by far the world’s largest buyers of US weapons. The King of Saudi Arabia is by far the world’s richest person, with a net worth well over a trillion dollars; and, when his (Aramco’s) 260 billion barrels of oil reserves were valued at $100 per barrel, his net worth was over $15 trillion. The King has total control over the world’s largest (in terms of dollar-value) company: Aramco. Since 1980, the Saudi government has owned 100% of it; the Saudi government is totally under the King’s exclusive control. The King owns all that oil. Forbes and Bloomberg decline to estimate his wealth, because kings don’t want them to; but, clearly, it dwarfs that of anyone such as Bill Gates or Warren Buffett. And Gates and Buffett don’t possess the power to keep their wealth from becoming published, but the Saudi King does. On 13 September 2010, Britain’s Telegraph headlined «US secures record $60 billion arms sale to Saudi Arabia». On 28 January 2012, Dayton Business Journal bannered «Top 10 foreign buyers of US weapons», and Saudi Arabia was #1 that year, with $13.8 billion. #2 was UAE, with 10.4 billion. UAE is run by six royal families, all friends of the Saud family; and, like the Sauds, they follow the strictest, Wahhabist-Salafist, form of Islam, the type of Sunni Islam that’s preached by ISIS and by Al-Qaeda. Current ‘defense’ expenditure figures aren’t available; but, clearly, the Sauds are now fully embroiled in slaughtering Shiites both in Yemen and in Syria, and are buying far more US weapons today than they were before – the sum probably dwarfs any previous sales-volume. The Sauds have long been courted by US Presidents; but, actually, it’s the US Presidents who have been courting the Saudi kings. The Washington Post headlined on 27 January 2015, «13 times US presidents and Saudi kings have met», and, since 1945, all US Presidents have privately met and spoken with the King of Saudi Arabia, except Truman and Ford. 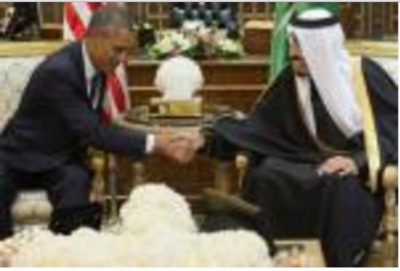 President Obama bowed deeply when meeting the Saudi King; but, this doesn’t mean that none of the others did; it means only that a cellphone-video happened to leak onto the Internet showing it – Obama’s bad luck. When the US President meets the Saudi King, it’s not the US leader who has control over the two holiest sites in the world’s second-largest and fastest-growing religion, Mecca and Medina. It’s not the US President in whose general direction more than a billion people around the world ritually bow several times a day. Long after a US President has become a former President, the Saudi King whom he has met can still be remaining as the Saudi King, until death. It’s sort of like the Papacy in that regard. Iran is the center of Shia Islam. The Saud family doesn’t hide that they are anti-Shia and very anti-Iran. The approximately 10% to 15% of Saudi Arabia’s population who are Shiites are discriminated against, by law, in education, work, and other ways, which have caused it to be termed a religious «apartheid». On 26 May 2014, Catherine Shakdam at International Policy Digest wrote that, «Driven by political and territorial greed, the House of Saud has served as ground zero for anti-Shiism. The nefarious force behind the region’s sudden burst of ethnic-based violence and prejudices, disseminated by Saudi Arabia has sown the seeds of intolerance in the entire Middle Eastern region». On January 3rd, Iranians rioted in Tehran against the Embassy of Saudi Arabia because a Shiite cleric in Saudi Arabia who had spoken out for equal treatment by the Sauds’ government, regarding both Sunnis and Shia, had been beheaded the day before, for having publicly urged such a thing. The Saudi King had had 47 people executed on January 2nd, and this Shiite cleric was only one; but he had been speaking for all Shia in Saudi Arabia; so, Shia everywhere felt as if they were the targets – and they actually were, because when in 1744 Muhammad Ibn Saud and Muhammad Ibn Wahhab came to the agreement that started Saudi Arabia, part of that agreement was for the Saud clan to exterminate all Shia, and today’s Saud clan might actually have enough wealth to give that a try. They’re getting plenty of weapons from America to do it. The US Democratic Party’s candidate for President, Hillary Clinton, said: «I don’t think it was a smart decision for them to make». She didn’t say it was a wrong decision, just that she didn’t think it was «smart». King Salman al-Saud will probably be understanding; after all, her suckers think that their Party is democratic in more than just its name – they don’t like head-choppers, particularly not dictatorial ones; and most of them don’t even think much of the Wahhabist religion, which wants all non-Wahhabists dead, not merely Shia dead. By contrast, Republican candidates don’t need to pander at all about the matter, because they don’t consider themselves to be hung up on the ‘democracy’ thing; they call themselves «Republicans», which, even though it actually means the same thing (and so no democracy exists that isn’t a republic), makes it easier for stupid people to think it doesn’t. Republican candidate Carly Fiorina said: «Saudi Arabia is our ally, despite the fact that they don’t always behave in a way that we condone… Iran is a real and present threat». She was singing King Salman’s song. She even condemned Iran’s condemnation of the Sauds’ execution of the Shia-rights cleric: «I take the Iranian condemnation with a huge grain of salt… This [in Iran] is a regime that tortures citizens routinely, that thinks nothing of executions, that still holds four Americans in jail». Republican candidate Ben Carson said: «The Saudis have been one of our strongest allies in the Middle East, and I think it’s unfortunate that we put them in the position we have by showing the support to Iran that we have with this foolish deal» on Iran’s nuclear program. «There’s no reason for the Saudis to believe that we’re really on their side when we do things like that». If anything, he was trying to outdo Fiorina or anyone else. The Saudi King terminated diplomatic relations with Iran over the matter. US President Barack Obama, via his State Department, said in response to that: «We’re aware that the Kingdom of Saudi Arabia has ordered the closure of Iranian diplomatic missions in the Kingdom. We believe that diplomatic engagement and direct conversations remain essential in working through differences and we will continue to urge leaders across the region to take affirmative steps to calm tensions».